The Lake Tahoe area is one of the most popular tourist destinations in the United States. The scenic beauty, superb hiking and world-class skiing attract visitors year-round. The Lake Tahoe area encompasses a large area, and includes the cities of Truckee, South Lake Tahoe, Tahoe City, Stateline, Incline Village and several other small towns. Lodging in the Lake Tahoe region varies from small motels that are still affordable, to high-end lodging that runs in the hundreds of dollars a night. As traveling from one end of Lake Tahoe to another can be a time consuming affair due to traffic, the slow speed limit and the weather, when choosing lodging in the Lake Tahoe region it is always best to find lodging that is closest to where in the Tahoe area you want to be. 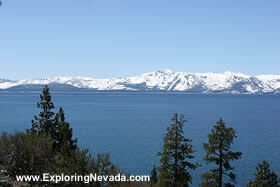 In short, if skiing at Heavenly is what brings you to Tahoe, consider finding lodging in the South Lake Tahoe area. Below are the varoius hotels and casino's in the Lake Tahoe region that are available for online booking.